A beautiful and distinguished family. A private island. A brilliant, damaged girl; a passionate, political boy. A group of four friends—the Liars—whose friendship turns destructive. A revolution. An accident. A secret.Lies upon lies. True love. The truth. I don't know why on earth I thought this book was going to be a "quick, light read". Exhibit A: The Cover: With it's sunny, ocean blue colours and the group of happy teens. Exhibit B: The Premise: Mysterious and not too telling. How big could this secret be?! As you can see, I was completely proven wrong! I was not expecting this book to take out my heart and toy with it in it's precious hands! This was my first book my E. Lockhart but I have heard many wonderful things about her book. I was perusing my bookstore and finally thought I should pick up this book that I heard so many(not too detailed) things about! Firstly, it is no freaking shock that this book won The 2014 Goodreads Choice Award. Once I learned that I thought, "well no Sh!t, Sherlock!". This book should have won every book award possible! E. Lockhart's storytelling was poetic, lyrical and just flowed so beautifully off the pages. You can't help but be immersed by it. 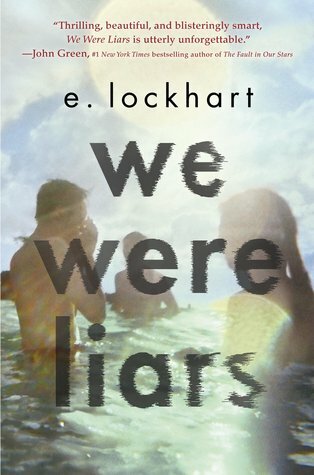 Her writing style is unique and just added to the already perfect package of We Were Liars. I can almost guarantee that you will not be able to figure this book out until it's revealed for you. The book had already revealed a few secrets, and I thought that would be all...Then WAM! Lockhart pulls out another jaw-dropping curve ball that left me sobbing...again. Gat, Mirren Johnny and Cadence are a cast of Characters that I will never forget. Although the story is told from Cadence's perspective, there is not one character that outshines the other. These Liars are a package deal and they each possess wonderful, heartbreaking, hilarious and haunting qualities that will have your heart exploding. I hope you have room in that heart of yours because these Liars are going to nestle their way in there whether you like it or not! This book deserved every bit of hype it got, and in fact deserves even more! It is haunting, curious and magical. It will make you cry, laugh and then cry again. Please, go out and get this book now if you haven't read it already! And with Christmas around the corner, I highly recommend We Were Liars for the Bookworm in your life! Game hay nhat 24H đã chọn lọc, tro choi được việt hoá + tính điểm xếp hạng.Các game mini hot nhat, game vui hay nhất như game nong trai, game dua xe.